0800 numbers can encourage your potential customers to call you as it is free for them. The number is portable and can be terminated to your landline or mobile. alphaTALK have been supplying 0800 numbers to businesses small and large since 1996. These numbers have helped hundreds of businesses maximise their marketing potential by encouraging customers to call them – for free! 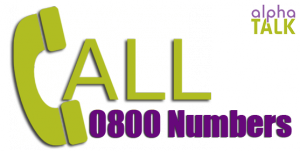 0800 is the most popular and widely-recognised non-geographic number range in the UK. Everyone knows what a 0800 number is – Freephone – and that they can call it without fear of any call cost. Because of this, customers (and potential customers) are much more likely to call an 0800 numbers than any other type of number. Imagine you’re running a marketing campaign – perhaps distributing leaflets or running a TV or radio advertisement for your business. Marketing campaigns like these are a significant investment and, obviously, you’d be anxious to see a good return on that investment. Your advertisement is seen by the target audience who are presented with a highly-memorable 0800 telephone number to call. The audience already know that 0800 is Freephone – they’ve been used to seeing it in advertisements for major brands for years – and that calling your company to enquire about your product or service will cost them nothing. Imagine the increase in return on investment this could bring your business! There are no long contracts with any of our numbers, so if you connect an alphaTALK 0800 numbers for a particular advertising campaign, you can simply cancel it once the campaign has run its course. Or, keep it for use with future campaigns! You’ll receive full itemised billing so you can see exactly how successful your marketing campaign is and how many calls it is generating. Express your interest in particular numbers now by contacting a member of the alphaTALK team on free phone 0800 093 2193 or visiting the alphaTALK website’s 0800 numbers page.